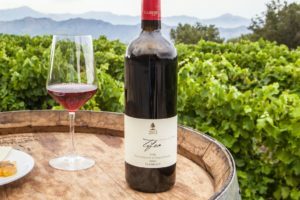 Sicily Daily Itinerary | Pack A Fork! 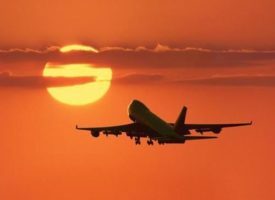 Travel from your home city to Palermo, Sicily and arrive the next day. Welcome to beautiful Sicily! Take time to check in to the hotel and relax. In the evening, meet your fellow travelers, tour guides and director during Tour Orientation. You learn more details about the logistics of the tour. Afterward, we’ll enjoy a Welcome Dinner in Palermo featuring traditional Sicilian cuisine. Today, we’ll take a guided tour of Palermo to orient us to Sicily’s capital city. Palermo was founded in the 8th Century BC by Phoenician tradesmen who settled around its natural harbor. Palermo has a rich history coming under Roman, Norman and Muslim rule. The highlights of the day will be the 11th century Palazzo dei Normanni – the former Phoenician fortress, Our Lady of the Assumption Cathedral, the Piazza Vigliena and the Teatro Massimo – the largest theater in Italy and the setting for a scene from the Godfather. We’ll enjoy lunch at a cafe and then have a chance to shop, wander the streets of Palermo or walk on the beach. 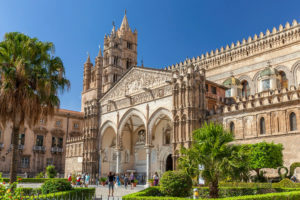 It will be a day of experiencing the best of Palermo’s history, the Sicilian culture, its grand Baroque architecture and all the city has to offer. The evening will be at leisure. 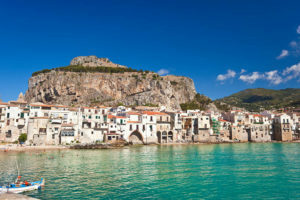 We will embark on a day excursion to the ancient town of Montreale and the seaside town of Cefalù. The Cathedral of Montreale sits high above and overlooks Palermo. King William II founded Montreale’s majestic cathedral and Benedictine monastery in 1174. A medieval village surrounds the cathedral and monastery. The cathedral interior is spectacular with ornate paintings, intricate mosaic and detailed stonework – some of the best of its kind in Sicily. After our visit to Montreale, we’ll head to Cefalù, one of the most beautiful seaside villages in Italy. Known for its unpretentious charm and appealing sandy beach stretching alongside the town, we’ll have lunch and take a walk on the beach. Towering behind the town is a massive rock outcropping that rises up and sets the perfect backdrop. We’ll also wander into town before returning to Palermo. The evening will be at leisure. Today, we’ll store our bags at the hotel and visit two of Palermo’s local marketplaces: La Vucciria and Ballaro. 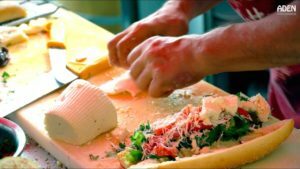 We’ll sample traditional Sicilian culinary treats such as aracine (deep friend stuffed riced balls), sfincione (a Sicilian pizza), granita (a semi-frozen sorbet-like dessert) and gelato sandwiches like you’ve never tasted before. 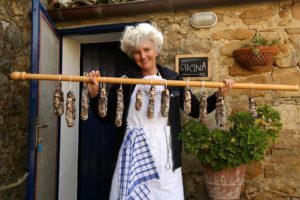 In the afternoon, we’ll depart Palermo and head toward the country arriving at Ana Tasca Lanza Cooking School. Upon arrival, we’ll settle in and later enjoy apertivos and a welcome dinner in the loveliest of farm settings. After breakfast, we will begin the day with a four-course cooking lesson highlighting Sicilian cuisine. Let yourself get whisked away in the process and enjoy the feast afterward accompanied by Tasca D’Amerita wines. After lunch, enjoy a guided tour of the Tasca’s culinary gardens and grounds. In the later afternoon, we’ll head to Regaleali Estate for a tour of the vineyards and winery. We’ll enjoy tastings of their exceptional wines and learn about winemaking in the region. The evening will be at leisure at Anna Tasca’s farm. Following breakfast, we’ll leave Anna Tasca’s and head to Agrigento on the southern coast of Sicily. Upon arrival, we’ll enjoy a private guided tour of the spectacular UNESCO World Heritage Site – Valley of the Temples. Here, we’ll wander amidst the remnants of seven Greek Doric temples from 500BC, including the magnificent Temple of Concordia. We’ll also visit the onsite Archaeological Museum and view the artifacts excavated from the surrounding ruins. That evening will be spent in Agrigento at leisure. In the morning, we’ll drive to the southeastern region of Sicily where we’ll spend a few days discovering this area of the island. There is much to experience in the medieval towns, fishing villages and coastal waterways in this region. It also has a culinary life of its own! We will arrive at Gli Aromi Herb Gardens where for 20+ years they have produced over 200 varieties of herbs that are endemic to this area of the Sicilian coast. We’ll enjoy a chef-prepared lunch featuring their herbs – we’ll try their Deep Fried Sage Leaves, for example. After lunch, we’ll be led by the owner on a ‘fragrance tour’. He is known for his knowledge and passion about his herbs. 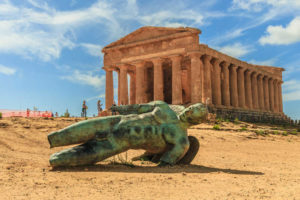 This experience will be a ‘hidden gem’ on our tour of Sicily! Afterward, we will head to Ragusa, a Baroque hilltop town, where we’ll stay for the next two nights, This entire region, called Val di Noto, is UNESCO-protected. The evening will be at leisure in Ragusa. Vendicari is one of the most popular nature reserves in Sicily. Its stunning beaches and dunes are surrounded by lush marshland. This reserve is vital to over 200 species of migratory birds. Pink flamingos and cormorants love this place for a reason! We will take a guided beach walk on the reserve and take a telescope to observe the birds. We’ll visit an ancient tuna factory, a Spanish defense tower and a Roman villa with stunning mosaics. 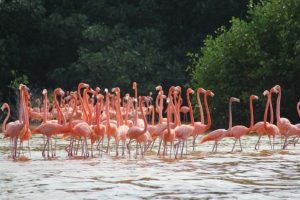 This visit is considered off-the-beaten-path and we will enjoy it with a local naturalist guide. We’ll end at a stunning beach where swimming is an option as this is one of the most pristine beaches in Sicily! Then, we’ll head to Marzamemi, a small picturesque fishing village. In the late afternoon on our way back to Ragusa, we’ll stop in the town of Modica at Antica Dolceria Bonajuto, the oldest chocolate factory in Sicily with its history of six generations of artisan confectioners and their love for Sicily. We’ll leave for Taormina today at the foot of Mt. Etna. On the way, we’ll stop in Noto to observe the beautiful Baroque architecture of this city. After a massive earthquake that destroyed almost all of eastern Sicily in 1693, cities and villages were reconstructed in the Baroque style of the day. Noto is one of the best examples of the Baroque architecture in this region. We’ll see some of the key city buildings, arches and piazzas. We’ll also make a stop at Caffe Siciliaa, the pastry shop of Chef Corrado Assenza of Chef’s Table Pastry fame, sampling some of the best pastries, granitas and gelatos in Italy. Then on to Syracuse, where we will take a guided walking tour of Ortygia Island, the historical center of Syracuse. Founded in 733BC by the Corinthian settlers, Syracuse became one of the first Greek colonies on the island of Sicily. It attained wealth and power, commissioned important buildings and works of art and, through warfare, became the most powerful city in the Mediterranean. 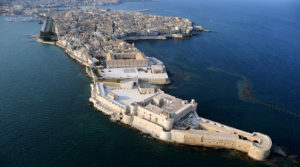 On Ortygia Island, we’ll see the castle/fortress on the seafront, a Greek temple, a legendary fountain and a limestone cave famous for its acoustic properties that amplify even the quietest of sounds. In the late afternoon, we’ll arrive in Taormina. The evening will be at leisure. Set on the eastern coast of Sicily, Mt. Etna is among Europe’s tallest and one of the world’s most active volcanos. Declared a UNESCO World Heritage Site in 2013, the volcano has shaped Sicilian history and continues to impact life on the island today. Today, we’ll take an easy hike with a guide to learn about the volcano, her flora, fauna and hidden secrets. Then, we’ll explore the beautiful wine region and culture of Sicily’s Mt. 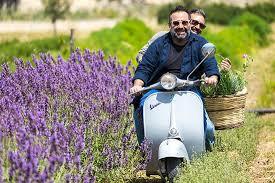 Etna DOC comprised of terraced vineyards and breathtaking panoramas. We’ll enjoy a winery tour and lunch at a family-run estate vineyard perched 800 meters above sea level on the sunny and breezy slopes of Mt. Etna. The evening will be at leisure. Today, we will sail off the coast of Taormina on a private catamaran. We’ll explore the beautiful coast of Sicily discovering sandy beaches and crystalline waters. Highlights of the cruise are Taormna Bay, the captivating Isola Bella/“beautiful island” and the coast south of Taormina. 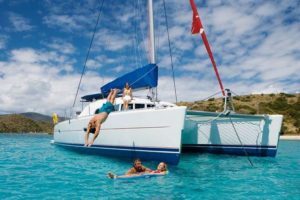 We’ll find a cove to set anchor and swim/snorkel in the clear waters (weather permitting). We’ll enjoy Sicilian food and wine on board while taking in the incredible scenery of this coastline with Mt. Etna in the background. The evening will be at leisure. Today is a free day to relax at the hotel, shop and explore Taormina on your own or with new friends. 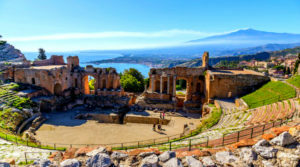 There are many sites to see such as the Ancient Theatre of Taormina, Palazzo Corvaja, the Villa Comunale park/gardens, the Santa Caterina Church or the fashionable Corso Umberto district with its narrow streets lined with cafes, boutiques, artisan shops and plenty of places to taste gelato! On our last evening in Sicily, we will enjoy a Farewell Dinner at a select restaurant in Taormina and say good-bye to our group and to Sicily – only for now! Today, we will transfer from Taormina to the Catania airport to travel home.